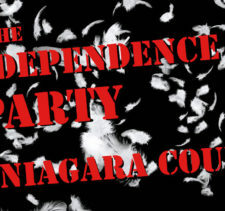 Subjects ranged from the need in smaller communities for elected representatives to file financial disclosure forms to the state comptroller losing the ability to review contracts and how that contributed to the Buffalo Billion corruption as well as professionalizing the state’s board of elections and making sure “shadow government affiliated non-profits” follow the same open meeting and FOIL laws as government bodies. “Being in a room full of citizen activists is about the most satisfying thing other than being a grandmother,” said Lerner, who praised the efforts of the members of BNCOG (Buffalo Niagara Coalition for Open Government), several of which were recognized during the evening for their tenacious work leading to increased transparency at the local level. Members of BNCOG as well as Assemblyman Robin Schimminger, who was praised for his legislation increasing accountability and transparency in government, listen to questions from the audience. 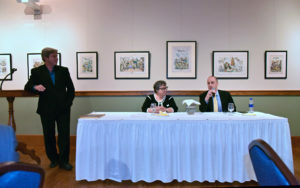 “The activism that you are being recognized for, the people who got the certificates, the people who are coming to the meetings are what makes our country work,” said Lerner, director of the advocacy group that originally helped pass the Freedom of Information Law in New York State during the early 1970s. “People who have an investment in government of, by and for the people is the most important thing that we as Americans have going for us,” she said. “Without people like you on the ground — at any level of government — it is simply a piece of paper that a governor signs with a pen,” Lerner said of the FOIL and Open Meetings laws. In order for the small but important changes BNCOG has pushed for locally to grow into a larger systemic and cultural change regarding transparency and openness in government in WNY, the state and the country, very simply more people need to be involved. 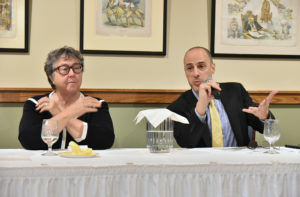 Susan Lerner of Common Cause and Alex Camrada of Reinvent Albany want to create more synergies between state-level organizations and grass-roots organizations like BNCOG that they said can serve as a template for the rest of the state. “Good government in New York State is only going to come about if we can turn out everyday people to get involved in caring about this much like you folks have done over the last few years,” said Camrada of Reinvent Albany. “Only it needs to be scalable across the state so you get to point where instead of thousands of people coming out for a charter school rally or for gun legislation you see the same level of people for ethics and campaign finance reform,” Camrada said. 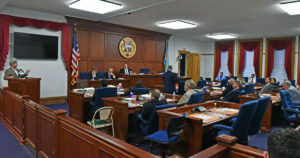 Since its founding in 2016 by attorney Paul Wolf, BNCOG, which promotes itself as a non-partisan group, has seen much positive media and governmental attention surround its annual reports on municipal websites and tracking executive sessions. 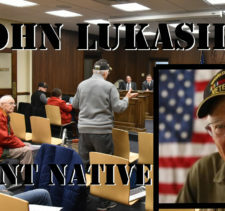 The efforts of its members have also led to greater openness and transparency — which is always in the best interest of residents and taxpayers and ultimately government itself — at the Lockport Housing Authority, the West Seneca Town Board as well as the Niagara County Legislature. 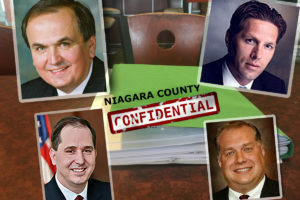 Paul Wolf, President of the Buffalo Niagara Coalition for Open Government President, addresses the Niagara County Legislature regarding the position the county’s 17-year-old law shielding the county’s financial disclosure forms from public scrutiny is, in fact, illegal. BNCOG is ready to file lawsuit against county’s financial disclosure law (Although a recently convened committee is considering changing it.) 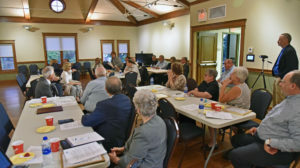 In addition, the county’s longstanding practice of holding committee meetings in rooms too small for the public to attend recently ended after drawing BNCOG attention. 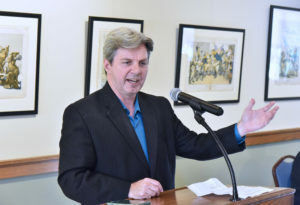 Attorney Paul Wolf, president of BNCOG, introduces the evening’s speakers at the Theodore Roosevelt Museum, 641 Delaware Ave.
DISCLOSURE: The author of this article is the secretary for the Buffalo Niagara Coalition for Open Government.